PHUKET: The recent arrest of a Patong tuk-tuk driver who threatened his passengers with a sword has served once again to reinforce the perception of tuk-tuk drivers as thugs and rip-off merchants. Patong Police Chief Col Tassanai Orarigadech’s condemnation of the driver’s behaviour as “unacceptable” seemed appropriate enough, but so far the punishment meted out does not square with Col Tassanai’s strong words. The driver, Pannawich Nakamin, 35, was fined B500 for carrying a weapon in a public place and will face a criminal charge of using a weapon to threaten a person for benefit at Phuket Provincial Court. “The tuk-tuk driver’s behaviour was unacceptable, and it damaged Phuket’s image among tourists. Tuk-tuk drivers must not do this to tourists,” said Col Tassanai, and The Phuket News agrees with this statement wholeheartedly. We urge Col Tassanai to press any and all other possible charges against Pannawich, including section 267 of the Thai Criminal Code on falsifying evidence – due to the fact that the driver did not hand over the actual weapon used in the altercation. “Whoever causes an official in the execution of their duty to make any false entry in the public or official document for the aims to be used as evidence, shall be imprisoned not more of three years or fined not more of six thousand baht, or both,” states section 267 Thai Criminal Code. Police should also strongly recommend that the court impose a custodial sentence on Pannawich if he is found guilty, in order to send a strong message to other tuk-tuk and taxi drivers that thuggish behaviour like this will not be tolerated. The initial B500 fine issued by the police is almost comical, considering that the violence broke out due to an argument over the B400 fee Pannawich was demanding of his passengers for taking them from McDonald’s on Thaweewong Rd to Soi Kebsup – a distance of about 1.5 kilometres. Clearly, this paltry fine will have no deterrent effect on drivers who considering resorting to violence and threats during disagreements with passengers. An example needs to be made. 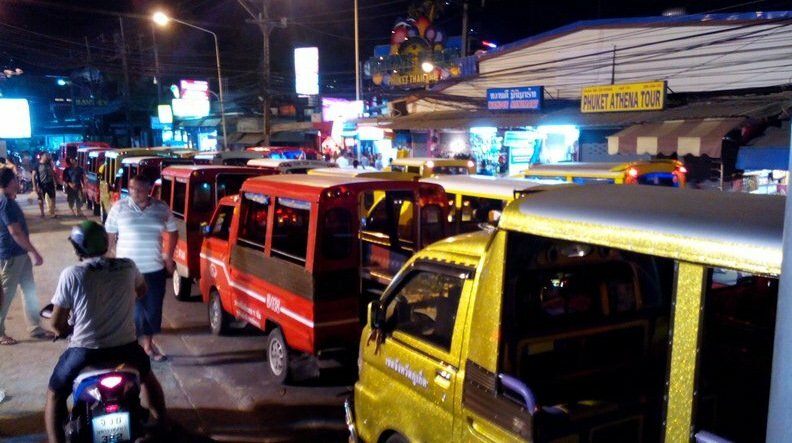 Given the recent army crackdown on tuk-tuks usurping public car parking spaces in Patong, now is the perfect time to further reinforce the message that tuk-tuk drivers are not above the law and will be held accountable when they break it. Yes strong words, how the tuk tuk mafia must be shaking in their boots at such strong action! Glad to see the offender (alleged? 555) has now been named at least. Is there an non-blurred picture of this weasels face available yet? Col Tassanai did his job. The Tuk Tuk driver was arrested. It is the Prosecutor's office that must assess additional charges and agree to press the charges Col Tassanai has recommended. The system is bigger than one man...as it should be. Give Col Tassanai time and he will clean up Patong. Thank you, Patong Police! Today I parked my car in Patong and NOT challenge by a Tuk Tuk driver to move. Thank you!